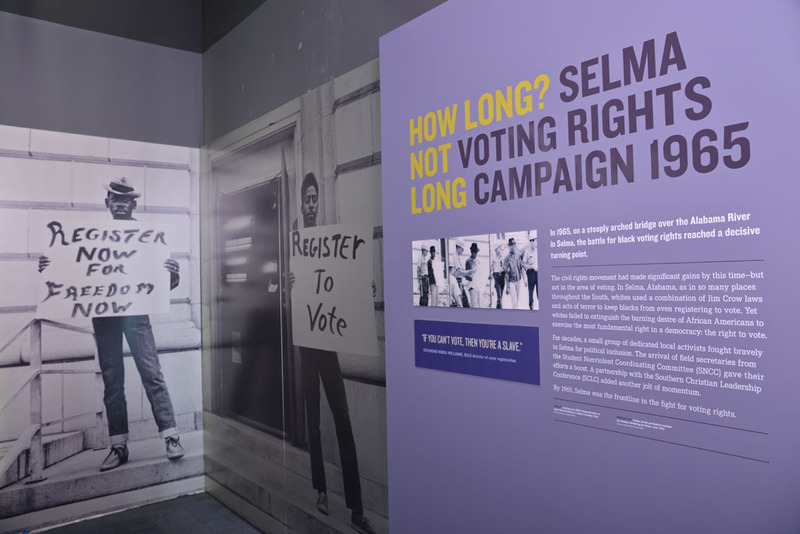 An interactive light box explains what African Americans were risking when they registered to vote: the safety of their families, their jobs and their congregations. Visitors can listen to a phone conversation as President Lyndon Johnson and Dr. Martin Luther King Jr. worked together to pass the Voting Rights Act. Then, as visitors cross the Edmond Pettus Bridge, they walk into a monumental-sized screen of film on the Bloody Sunday attack on peaceful protestors. From there, visitors successfully march from Selma to Montgomery, culminating with Dr. King's delivery of the "How Long, Not Long" speech from steps of the Alabama state capitol.